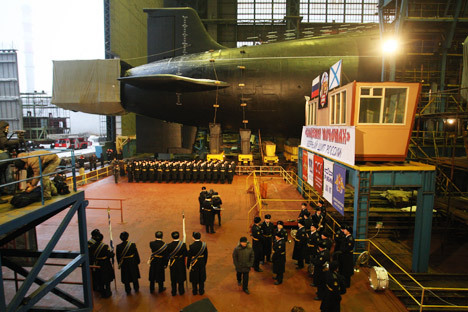 A Russky Reporter correspondent traveled to Severodvinsk to visit the top-secret shipyard and saw a submarine being built. Half of the world's supply of nuclear weapons is hidden under water, in the missile tubes of nuclear submarines plying 70 percent of the globe. As complex as spacecraft, just 6 countries possess nuclear submarines: India, China, Britain, France, the U.S. and Russia. Daniil Ilchenko traveled to Severodvinsk, where he visited a top-secret shipyard and saw with his own eyes Russia’s underwater missile shield being built. “It's like taking a child to school for the first time: On the one hand, it’s a sort of coming of age, but, on the other, you know, it’s just the beginning,” says Nikolai Semakov, the deliverer of the first fourth-generation Russian submarine known as the Yury Dolgoruky (Borey-class project number 955). Semakov is head of Sevmash’s construction section. It took him 17 years to build his first submarine. “It was a test of our entire industry, because every order involves more than 600 companies—an entire industry! Can we make such a complex product? We learned from experience that the situation is not all that bad. All sorts of problems arose in the course of the work and a lot of things had to be refined after testing, but we built our next ship, the Alexander Nevsky, in seven years, and the Vladimir Monomakh in six years,” says Semakov. From tugs and barges to pontoons and fish factories, in the last couple of decades, Sevmash has built more than 100 ships for Germany, Sweden, Norway and the Netherlands. The development of civil shipbuilding kept Russia’s largest defense shipyard afloat and, in effect, saved it from ruin in the 1990s. “Submarine-building is a business nowadays. Gone are the days when the party leadership handled our production-related issues. Today we need to be able to negotiate both prices and delivery dates. We survive by hook or by crook in difficult market conditions,” says Alexandra Vlasova, head of the company’s testing and measurement group and winner of the national Engineer of the Year 2012 award. Actually, submarines are not built, but welded. Today’s submarines have millions of welds joining hundreds of thousands of components. The company keeps track of who performed each weld, and this information is stored for as long as the submarine is in service. While every weld is thoroughly checked by X-ray and ultrasound analysis, the personalization of responsibility for a potential disaster on par with Chernobyl significantly improves the quality of the work. Still, there are places where human welders cannot work. For these places, you need a robot. “Here, the welded seam is nearly perfect,” says first-category electrical engineer Sergei Ryzhkov, gravely. We stumbled upon a small porthole located at the halfway mark of a huge barrel that is four stories high and can hold 237,755 gallons. Behind a thick pane of glass, a huge terminator-like hand hovers over a pile of iron. Instead of a brush, the computerized hand holds an electron-beam gun. The electron beams coming out of the barrel glide over the surface of the metal in a yellow speck, leaving a perfect weld. “It is remarkable that all of the mechanical equipment was made in Russia. The Progress Research Institute in the city of Izhevsk still produces such things. The gun can do practically any maneuver. It is a unique assembly. Many people know about this and are envious—the Americans, the Japanese and the Germans,” says Ryzhkov. The near-perfect vacuum in the barrel ensures a far better weld than without it. In this chamber, the welds are made at the nodes responsible for noise dampening. Stealth is the main weapon of any submarine. It is the entire raison d'etre of the submarine fleet. A submarine that is discovered is as good as destroyed, so the need to keep the noise low is a constant headache for those who design them. The electron-beam welding device largely solves the problem. The black-as-pitch anti-echo envelope is only the outward aspect of the technological treasures carefully hidden under the high-strength steel hull. It is the know-how that allows Russian submarines to escape detection in the midst of NATO anti-submarine military exercises and sometimes visit the Gulf of Mexico. These submarines have, as it were, keen eyes and sensitive ears, preventing the appearance of and enabling the recognition the enemy at a distance of over 125 miles. First published in Russian in Russky Reporter.